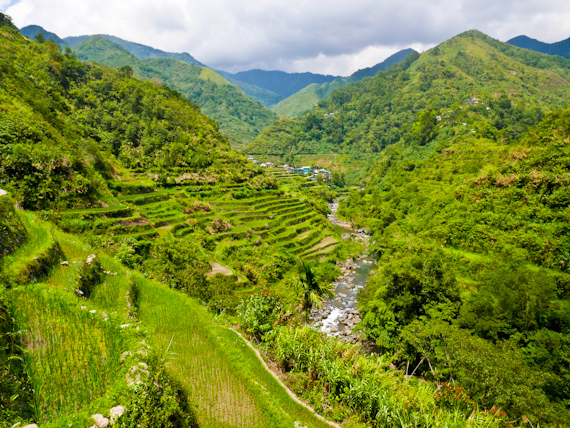 Now a UNESCO Heritage site, the Banaue Rice Terraces, in the mountains of Northern Luzon, are said to have been built around 2000 years ago by the ancestors of the Ifugao, the indigenous people, who still live here. Rupert Parker sets out to take a look. It’s a ten hour drive from the Philippine capital of Manila, mainly flat, though open countryside, but finally the road begins to climb as it reaches the Cordillera, a series of spiny mountains that reach around 2900m. It begins to narrow and negotiates the gradients in a series of long curves before reaching the scruffy town of Banaue at 1200m. It’s raining and the hills are covered in mist, preventing me getting my first glimpse of the famous rice terraces. They’re frequently called the “Eighth Wonder of the World” and were built by hand, using mud and stones. They’re irrigated from above, and if they were laid end to end, would encircle half the globe. Next morning the cloud is still hugging the hills but rain has stopped and the sun begins to burn through. The Ifugao were once fierce head hunters, hiding deep in the mountains and never succumbed to the Spanish colonisers. It was only in the 20th century that American missionaries began to make headway, converting them to Christianity, although around 5% still practise the old animistic religion. Their culture revolves around rice, with an elaborate array of rituals linked with planting, cultivation and consumption. There’s only one harvest a year and, when scientists tried to introduce more productive strains, the locals didn’t like the taste. Even worse, the new rice couldn’t resist the winds blowing through the terraces and the experiment was a complete disaster. My first stop is above the village of Bangaan and I’m surrounded by carpets of green tumbling steeply down hillsides, studded with water and climbing up to the sky beyond. It’s April and the first seedlings have already been transplanted to the rice paddies and will stay there until the harvest in September. 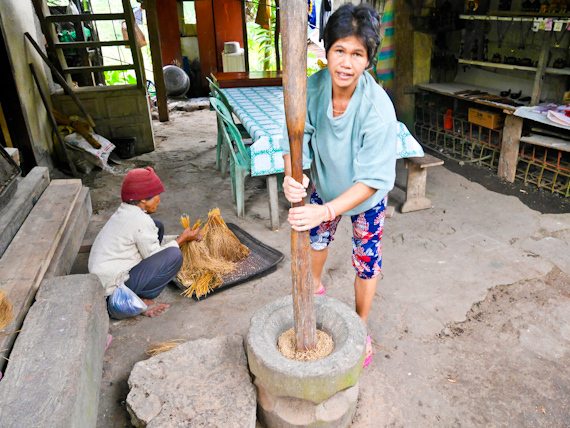 In the village women are sorting the dried sheaves of last year’s rice, while their daughters pound the husks. Retracing my steps and carry on to the saddle above Batad. They’ve only just driven the road through here and vehicles are still clearing rock falls and mudslides. The terraces, if anything, are even more spectacular and I set out to hike to the village of Cambulo. The path climbs uphill, through the terraces, before leading into a small forest, dotted with waterfalls. It emerges at a small shack which I’m glad to see sells welcome refreshments. From here, the terraces get steeper and the narrow path leads along the edge of the paddies, water on one side and a steep drop on the other. You need a certain amount of nerve, and a good sense of balance. In the distance I can see Cambulo, not much more than a cluster of houses, completely inaccessible by road. As I arrive, there’s work going on. I can see men busy replacing the thatch of the traditional wooded houses. 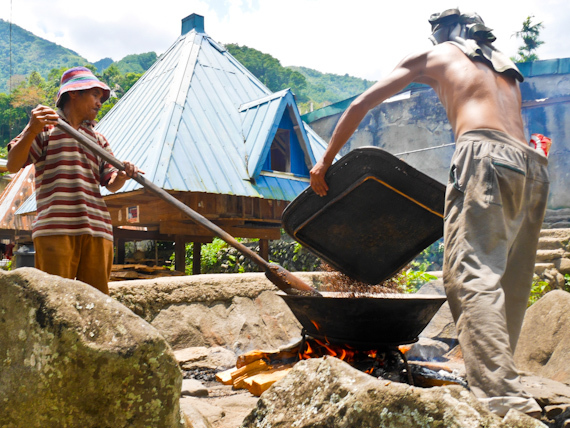 Even better others are toasting rice in huge woks, the first stage in the manufacture of rice wine. When the grains are blackened, they’re transferred to huge vats of water to boil for 30 minutes. The final stage, when it’s cooled, is to add yeast and then the liquid is poured into jars to ferment. The longer you leave it, the stronger it gets. Of course it doesn’t last long, but I do sample a rare month old vintage before heading back to Batad. 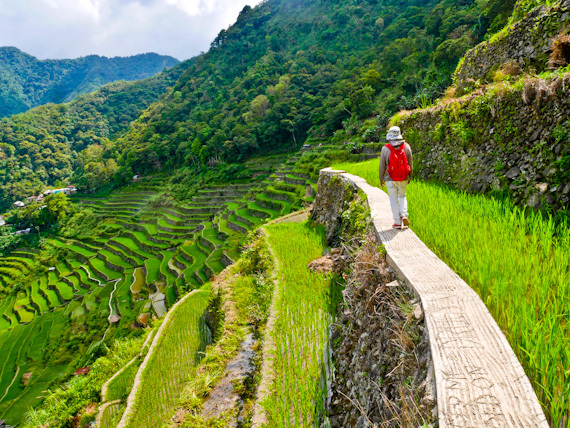 Although the Rice Terraces are now recognised by UNESCO as a World Heritage Site, they require a colossal amount of maintenance if they’re going to last. 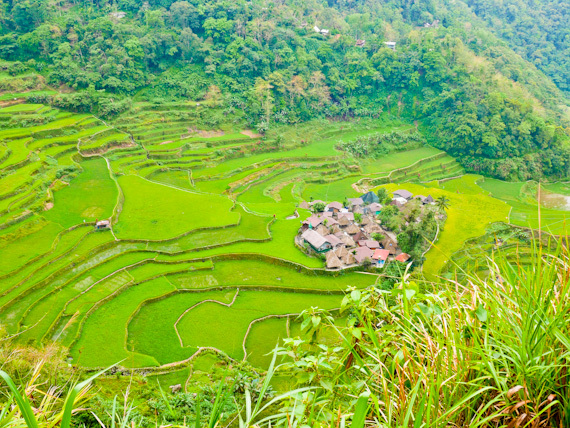 Fortunately, the villagers still depend on rice for their livelihood, and around 80% of the terraces are still cultivated. The danger is that younger Ifugaos are leaving to find work in the city which could lead to a manpower shortage in the future. I’ve only explored a fraction of the network of trails running through the rice terraces and you can easily spend a week trekking from village to village. 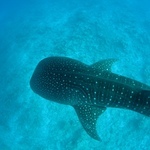 At the moment most of them are completely isolated but they’re slowly being connected to the modern world. 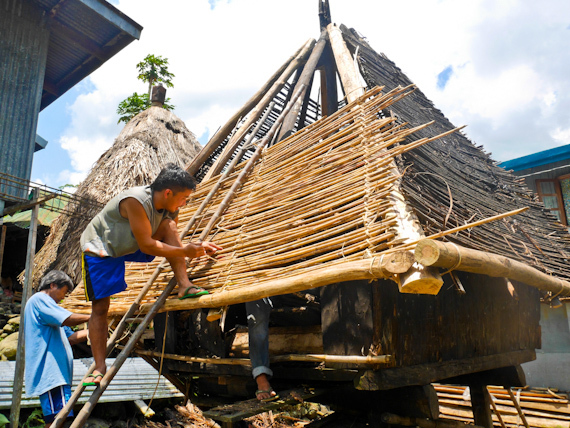 These days the Ifugao are remarkably hospitable and there’s no danger of losing your head. Just stay away from that rice wine. The Banaue Hotel makes a comfortable base to explore the region. Philippine Airlines flies direct from London to Manila. 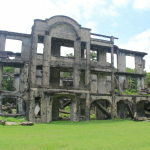 It’s More Fun in the Philippines has tourist information.